Athletes as “Heros?” Not to Me. I like some sports like baseball. However I have never been able to like or agree with the idea that sports athletes are “heros” – they are well paid and deserve their private sector salaries. However they do not fit the definition of hero. To me heros are members of the U.S. Military, police, fire fighters, etc. who put their lives on the line for us everyday. So when I read about the Nike campaign using a washed up former football player with the statement: “Believe in something. Even if it means sacrificing everything. Just Do It!” I automatically think of people like the men who stormed Normandy Beach in France decades ago to free Europe from the Nazi grip and ultimately end WWII. Many of them are still there in cemeteries proving their commitment to freedom. Some came home injured and/or carried the horrible memories of death and destruction for the rest of their lives so we can live with liberty and freedom. Sports players just don’t even come close to their sacrifices. So I will respect an athletes’ accomplishments but I will never call them heros for playing their chosen sport. Craig P. Alexander is an attorney in Dana Point, California. He practices law in the areas of the California Public Records Act, HOA law, Office and Commercial Leasing, Insurance Coverage and Business Contracts. 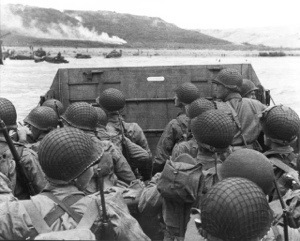 69 years ago today, 160,000 Allied troops landed on the beaches of Normandy France. We should never forget their bravery and sacrifice.